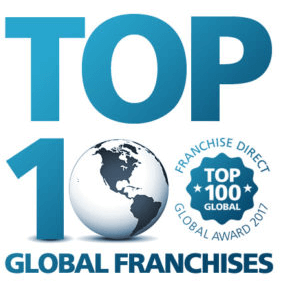 According to Franchise Direct, the franchises that comprise the Top 100 Global Franchises stand out from thousands of companies that have invested in international expansion strategies. This list is the premier, research-only based ranking of the world’s top 100 franchises and uses a methodology that goes beyond system size and financial performance. The rankings are based on objective and measurable criteria, which includes system size and revenue, stability and growth, number of years in operation and market expansion. Rankings are also based on franchisee support and training best practices, environmental policy and social responsibility. Each criterion is given a weighted value, and the data for each franchise is plugged into a proprietary computer formula, making the outcome as objective as possible.